Soffe Dri-release microblend performance fabric short sleeve tee. 85% poly/15% cotton. Removes perspiration fast and dries 4x faster than cotton. Wet garments rob your body of energy. Dri-release moves sweat and moisture from the skin, through the fabric and releases it into the air faster than cotton and other performance fabrics. Contains FreshGuard which virtually eliminates odor. 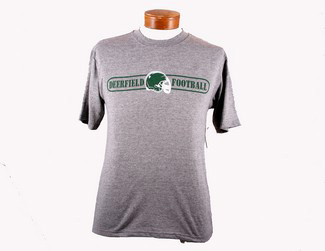 Dark heather grey with Team designs screen-printed in green on chest. Unisex adult sizes S-XL (Football to XXL).